This month our usual Component of the month makes way for a themed challenge chosen by Karen Totten. The symbolism and mythology surrounding Ravens is broad and varied and crosses many cultures. If you would like some more insight Karen’s original post looks at the Native America perspective while Jenny’s recent post looks at Ravens in Celtic mythology. I hadn’t intended to follow any particular cultural viewpoint but I did revisit the Edgar Allan Poe’s poem ‘The Raven‘ before I started…I had several ideas for challenge pieces and they do all seem to have something of a Gothic feel to them. Most of them are also works in progress rather than the complete article. My first piece came about through the fortunate Bead Fest purchase of this gorgeous porcelain cabochon by Joan Miller which I decided to bead bezel. To really make the beautiful bird pop I kept to very dark colours with matt beads to reflect the matt black glaze, highlighted by beads with that oil-slick appearance you see on the plumage of black birds and red beads to pull in the background. The result was this ‘cameo in negative’ like appearance which I am really pleased with. 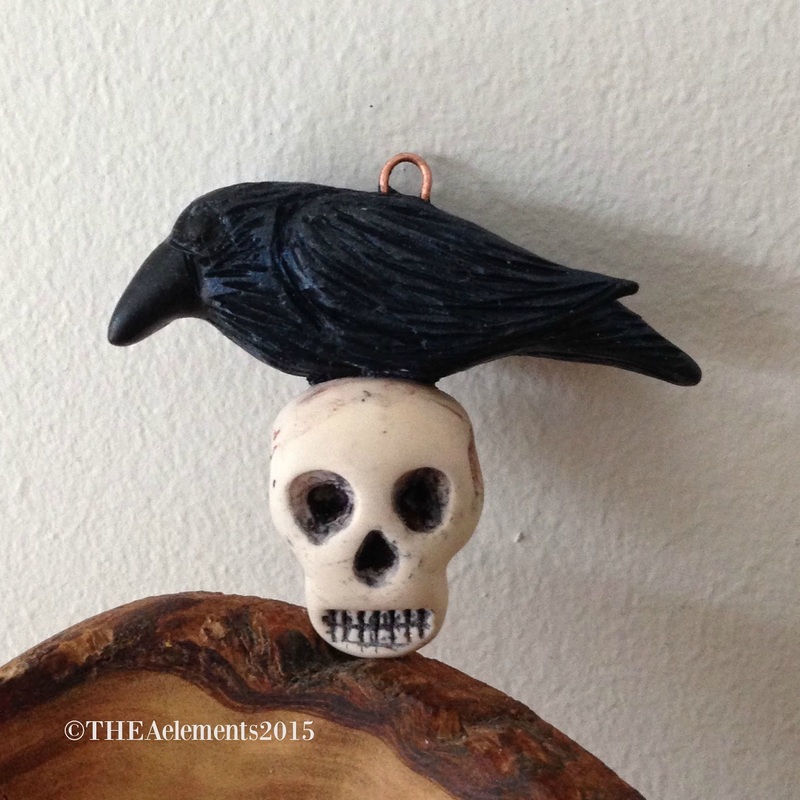 I’ve called it ‘Nevermore’ from the poem. I’ve been trying for a while to turn this into a necklace but as yet I haven’t been able to decide how to do it. I love how these blood red pearls work with the pendant but it seemed somehow too simple to use them alone. Ribbons, silk and chain came out and I still couldn’t come up with the right combination. Black lace has been in at the back of my mind all along but I kind of discounted it for being too obvious… but now I’m thinking I might have to go get some and give it a go if only to prove myself right! Otherwise it will sit in its project tray until the perfect idea strikes. 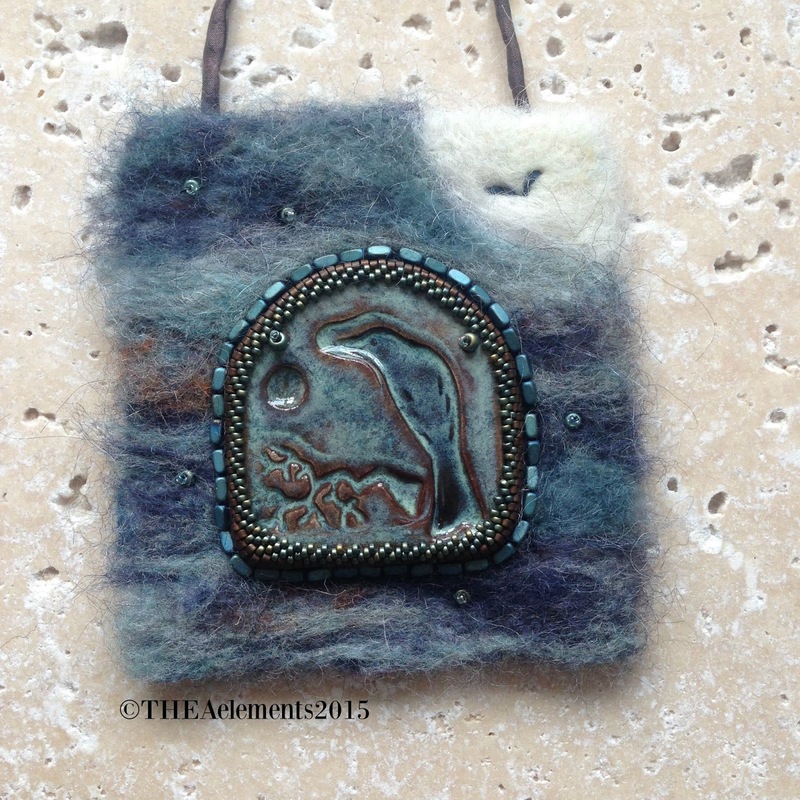 I’d just started my foray into felting when this challenge was launched and when I found this next pendant by Jenny Davies-Reazor in my stash I thought it would be a good subject for a non-jewellery piece. I love the shape of the pendant and the way it evokes the view from a castle window or some such. I bead bezelled the pendant onto beading foundation and then did a little experiment by needle felting directly onto it. This is a very small piece – maybe three inches square and the technique seemed to work although I’m not sure the foundation would stand up to the needle felting on a larger scale. A few beads for added interest, a silk string to hang from and a backing of ultra suede completed my first miniature art piece. Ravens (who will feed on carrion) are often depicted sitting on human skulls and have associations with warrior goddesses and battlefields in Celtic and Irish mythology (see Jenny’s post for more info). While this may seem a little macabre skulls are actually symbolic of courage, death and rebirth and amongst the many ideas the Raven symbolises are birth and freedom. I wanted to have a go at interpreting this aspect of the Raven in ceramic clay but haven’t had a chance to work in this medium of late so I decide to try it out in polymer clay. I don’t have the greatest skills as a sculptor so this pendant is a little naive and clumsy but it’s a starting point and I may well pursue it in porcelain where I find it easier to achieve a more detailed finish. 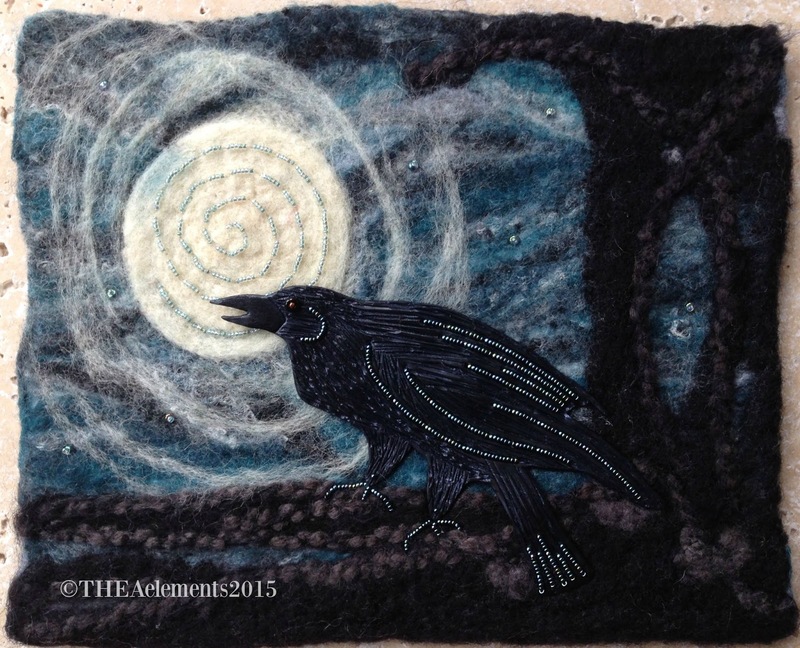 Last up is a mixed media piece called ‘The Night Watch” which combines wet and needle felting with polymer clay and bead embellishment. I’d recently completed a piece using these materials and it got me really fired up so this was the ideal theme to explore it further. The rather dramatic backdrop of the moonlit sky silhouetted by trees was created by wet felting and then defined with needles. 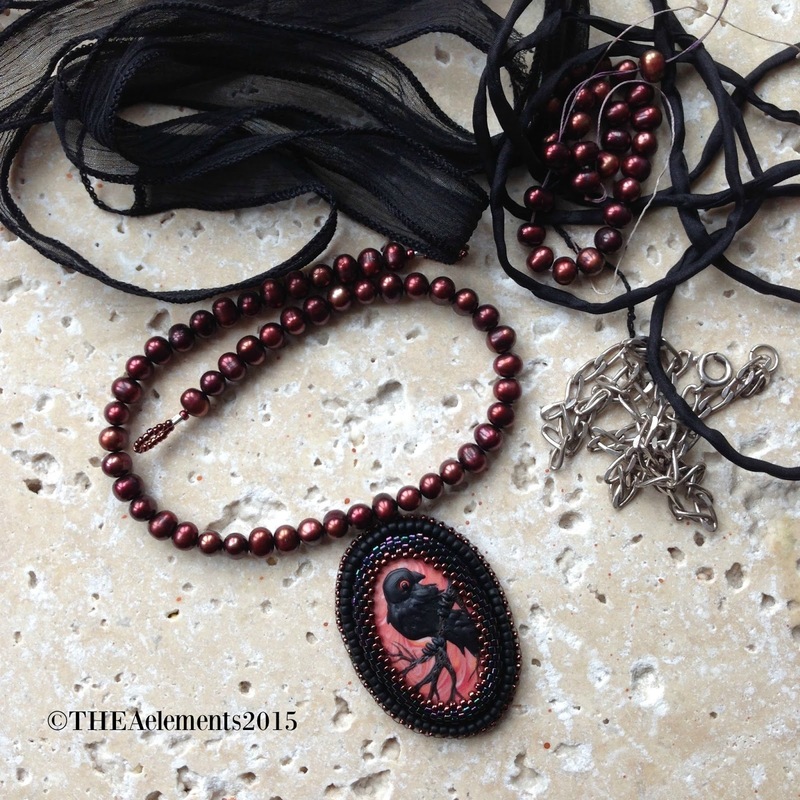 The moon and sky are embellished with seed beads and the Raven, made from polymer clay is embellished and attached to the backdrop using tiny seed beads. The beads are actually a dark oily blue rather than the silver they appear and are an absolute nightmare to photograph! This piece is not quite finished yet…the trees need a little something extra to lift the texture but I’m liking where it’s going thus far. So there you have my interpretations of our Raven theme and I hope you enjoyed them…now you can use the links below to see what the other AJE team and guest participants have come up with it…I know there are some great designs to see.